Thanks to my new phone, I can finally tweet on the go! I've been having a great time playing with my new phone, which is also a gift from B. What I love most about the G8 is that it serves my needs for Wi-Fi access and dual-SIM (one line for business and the other for pleasure) in a compact handy device. And since I have a wireless router in my office, I can also enjoy internet access on my phone from any room in the house so that's another plus point! Speaking of wireless routers, it took some time for me to configure and pair my new phone with the router. That's because I forgot my password and spent almost an hour retrieving it. After two tries, I successfully connected my phone to my wireless router and now I can happily tweet or check my email or say hello to my Facebook friends using my phone. So that's a really cool feature for me and YAY for wireless routers! I have yet to try using the Wi-Fi feature outside of my home though. 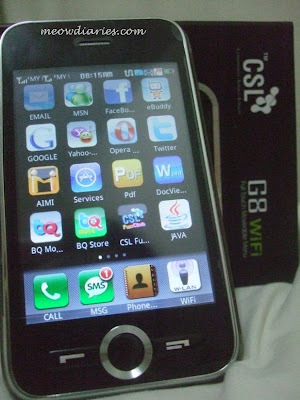 The last time I went to a Wi-Fi cafe for dinner, I was anticipating a fun dinner while surfing online on my G8. Unfortunately, the cafe chose that particular day to have a system error so there was no Wi-Fi access. I can't wait to try out my spanking new G8 from the next Wi-Fi Hotspot we choose but until then; I'll continue tweeting on the go from my home sweet home. See you on Twitter! I got to forgo on my G8 this time dearie... Minnie's surgery is more pressing for us right now.. the estimate is already so high.. But so glad you're having fun with yours!!! can't wait to see you tweet when you're at wifi outlet!!! Aha, yerr lepas ni boleh la sentiasa kemaskini dengan cerita2 terkini, tak perlu berada di depan komputer pun kan? Wow! nice phone, lucky you. I like your phone, by looking at it is enough to convince me that it is an extraordinary phone with extra gargets. Sorry I haven't been active lately, my pc totally OUT! Luckily I still have my LT, but sometimes very bad connection, quite slowwww.. I am still in shock after the bad incident with my gas stove, I have inhale the poisonous gas which made me weak, luckily thanks to "intra" I consumed extra ml and now feeling much better. We’ll see dearie.. the doctor was so sympathetic that she didn’t work out the bill also.. but for sure .. high also coz ada blood transfusion and what not.. we’ll see .. maybe next month ada kemampuan kot..